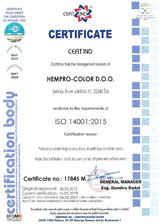 The Hempro-Color d.o.o. Sid is a reputable producer of paints, lacquers, school tempera, oil art paints, synthetic binders, plastic packaging and other chemical goods. The production range of the firm is intended to all sorts of protection and decoration of materials made in metals, wood, plaster and concrete within consumer goods and civil engineering, as well as to the specific market demands of the industrial products. Business premises, the infrastructure and three contemporary plants are located on an area of over 8,000 m2, and as a location occupies a very favourable position in the vicinity of the freeway E70 and the railway line Belgrade-Zagreb, which connects countries of the Western Europe with the Near East. The business philosophy of Hempro-Color is in the role of creating satisfying customers with whom along with an offer of products of a high quality, functionality and the contemporary design of packaging, as well as favourable prices and terms of sale, the strategic communication is obtained on mutual satisfaction. Within the factory there is a retail facility with the complete assortment of our products with action prices during the whole year.